It has been suggested that this article be merged into Escadron de Chasse 2/30 Normandie-Niemen. (Discuss) Proposed since April 2018. The Normandie-Niemen Fighter Regiment (French: Régiment de Chasse Normandie-Niémen - (Russian: Нормандия-Неман) is a Fighter unit of the French Air Force, which has adopted different formations and designations since 1942. Originally formed as Groupe de Chasse Normandie 3 in 1942, then redesignated as a Regiment (without and with "Niemen" designation the same year) in 1944, then given four different squadron numbers (1953, 1962, 1993, & 1995), and later two Regiments designations respectively (2008, 2011). 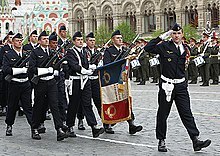 The regiment in Moscow in 2010. The unit served on the Eastern Front of the European Theatre of World War II with the 1st Air Army. The regiment is notable for being one of only three units from Western Allied countries to see combat on the Eastern Front during World War II, and Normandie-Niemen was the only Western Allied unit to fight with the Soviet forces until the end of the war in Europe. Initially the Groupe de Chasse 3 (GC 3) (3rd Fighter Group) in the Free French Air Force comprised a group of French fighter pilots sent to aid Soviet forces on the Eastern Front at the suggestion of Charles de Gaulle, leader of the Free French Forces, who felt it important that French servicemen serve on all fronts in the war. The groupe, first commanded by Jean Tulasne, fought in three campaigns on behalf of the Soviet Union between 22 March 1943, and 9 May 1945, during which time it destroyed 273 enemy aircraft and received numerous orders, citations and decorations from both the Free French and Soviet governments, including the French Légion d’Honneur and the Soviet Order of the Red Banner. Joseph Stalin awarded the unit the name Niemen for its participation in the Battle of the Niemen River. As of 2005[update] the unit, known as Escadron de chasse 1/30 Normandie-Niemen, flew Dassault Mirage F1CT aircraft. The squadron was briefly disbanded in June 2010 and re-activated in 2011 as a Dassault Rafale unit, with formal reactivation on 25 June 2012 as Escadron de Chasse 2/30 Normandie-Niemen. Six months after the Germans invaded the USSR in June 1941, talks aimed at closer co-operation between Free France and the Soviet Union resulted in setting up a special squadron with an initial core of 12 fighter pilots and 47 ground staff for service on the Russo-German front. De Gaulle officially ordered the creation of the Groupe de Chasse Normandie (GC 3) on 1 September 1942, with Commandant Pouliquen in command. Mechanics, pilots and hardware travelled by rail and air via Tehran to Baku. They completed a period of training on the Yakovlev Yak-7 by the end of January 1943, when Commandant Jean Tulasne took command of the groupe. The unit became operational on 22 March 1943. The first campaign of GC 3, equipped with the Yakovlev Yak-1 fighter, lasted until 5 October, and saw combat between Polotniani Zavod and Sloboda/Monastirtchina. It was hosted by a Soviet fighter regiment, and became that regiment's fourth squadron. From an initial aerial victory over a Focke-Wulf Fw 190 on 5 April their tally rose dramatically and the squadron became the focus of Soviet propaganda, so much so that Generalfeldmarschall Wilhelm Keitel decreed that any French pilot captured would be executed. Tulasne was killed in combat on 17 July, and Commandant Pierre Pouyade took command. On 11 October de Gaulle accorded the groupe the title of Compagnon de la Libération. By the time GC 3 relocated to Tula on 6 November 1943, only six pilots remained from the original groupe, which had accumulated 72 aerial victories since becoming operational. In their first year on the front they claimed 86 kills (77 confirmed, 9 'probables') and 16 enemy aircraft damaged, for the loss of 25 Yak fighters. In 1944 the groupe was expanded to become a régiment, with a fourth escadrille joining its ranks. After completing training on the more advanced Yakovlev Yak-9D fighter at Tula, the expanded regiment rejoined front line operations for its second campaign. This took place around Doubrovka (in Russia) and Gross-Kalweitchen (in East Prussia, Germany) until 27 November 1944. During this campaign Joseph Stalin awarded the regiment the name Nieman, (thus becoming Normandie-Niemen) in recognition of its participation in the battles to liberate the river of the same name. Giving Soviet units the battle honour names of places they had conquered was common. On 16 October, the first day of a new offensive against East Prussia, the regiment's pilots claimed 29 enemy aircraft destroyed without loss. By the following month the regiment found itself based in German territory. By the end of the year, Pouyade was released from command of the regiment and he, along with other veteran pilots, returned to France. He was replaced by Commandant Louis Delfino. By the end of 1944, 201 kills were claimed. 14 January 1945 saw the Normandie-Niemen start its third campaign (from Dopenen to Heiligenbeil), concentrating in the East Prussian part of the German Reich, until the formal announcement of victory in the east on 9 May the day after V-E Day in Europe. The USSR expressed its gratitude to the regiment by offering 37 of the unit's Yak-3 fighters as a gift to France. The pilots returned to a heroes' welcome in Paris on 20 June 1945. At the end of the war, the regiment had claimed 273 enemy aircraft shot down, 37 probables, and lost 87 aircraft and 52 pilots in return. Some 5,240 sorties were flown and the unit took part in 869 dogfights. The unit also destroyed 27 trains, 22 locomotives, two E-boats, 132 trucks, and 24 staff cars. Forty-two of the squadron's pilots were killed and 30 reached ace status. Four of its pilots, Marcel Albert, Marcel Lefèvre, Jacques André and Roland de La Poype, became Heroes of the Soviet Union. Its battle honours included such names such as Bryansk, Orel 1943, Ielnia, Smolensk 1943, Orsha 1944, Berezina 1944, Niemen 1944,Chernyakhovsk 1945, Königsberg (later renamed Kaliningrad by the Soviets), Baltiysk 1945, and Pillau. It received the following decorations: from France, the Légion d'Honneur, the Croix de la Libération, the Médaille Militaire, the Croix de guerre with six palmes; from the USSR, it received the Order of the Red Banner and the Order of Alexander Nevsky, with eleven citations between the two orders. After the war, the unit served in the Far East during the Indochina War from 1949–1951. The squadron's last Yak-3 fighter is on static display at the Musée de l'Air at Le Bourget. On 9 May 1995, the fortieth anniversary of Victory Day, the 18th Guards Assault Aviation Regiment of the Russian Air Force ("Vitebsk twice Red Banner Order of Suvorov")(or 18-й гвардейский Витебский дважды Краснознаменный ордена Суворова второй степени истребительный полк ВВС России "Нормандия – Неман" – in Russian) was also awarded the title Normandiya-Neman. The regiment was based at Galenki, Primorsky Krai, in the Russian Far East, as part of the 11th Air Army. It flies Sukhoi Su-25 ground attack aircraft. The regiment maintains the traditions of French-Soviet/Russian combat friendship. It was disbanded in 2009, but reformed at Chernigovka in 2013. The 1960 Franco-Russian film Normandie-Niémen directed by Jean Dréville and Damir Viatich-Berejnykh, relates the arrival in Russia of the first twenty pilots for intensive training and the formation of the squadron. In the Yuri Bondarev 1970-1971 Liberation film dramatization of the course of the war from the Battle of Kursk to the Battle of Berlin, the Normandie-Niemen makes an appearance. Pierre Pouyade is portrayed by Italian actor Erno Bertoli. Character Lieutenant Duroc (Patrick Chauvel) accounts his battles as Normandie-Niemen Free French fighter in Pierre Schoendoerffer's 1992 movie Dien Bien Phu. ^ The first was No. 151 Wing RAF – Nos. 81 and 134 RAF squadrons – which were stationed in Murmansk during September–October 1941. In Operation Orator (September 1942), a RAF-RAAF light bomber wing was stationed briefly at Vaenga. ^ Bernole, Andre, and Glenn Barnett, "French Aces on the Eastern Front", WWII Quarterly, Fall 2011, pp. 16-25, 94. ^ "18th Guards Fighter-Bomber Aviation Regiment". www.ww2.dk. Retrieved 17 April 2018. Serguei Dybov Normandie-Niemen. L'histoire complète d'un régiment légendaire, éditions Yaouza, Moscou, 2011, 320 p.
Wikimedia Commons has media related to Normandie-Niemen. Arrival of the Normandie-Niemen Regiment at Stuttgart, RETOUR DE L'ESCADRILLE NORMANDIE-NIEMEN Les Actualités Françaises – 29 June 1945, French national audiovisual institute INA.